Saturday June 16th 1923 Laura and I did some washing and I got our dinners. Rested in PM before going down to Mrs Smiths to a party. It was Cora birthday and we ate supper with The Whetstones and Rob took us to ride. 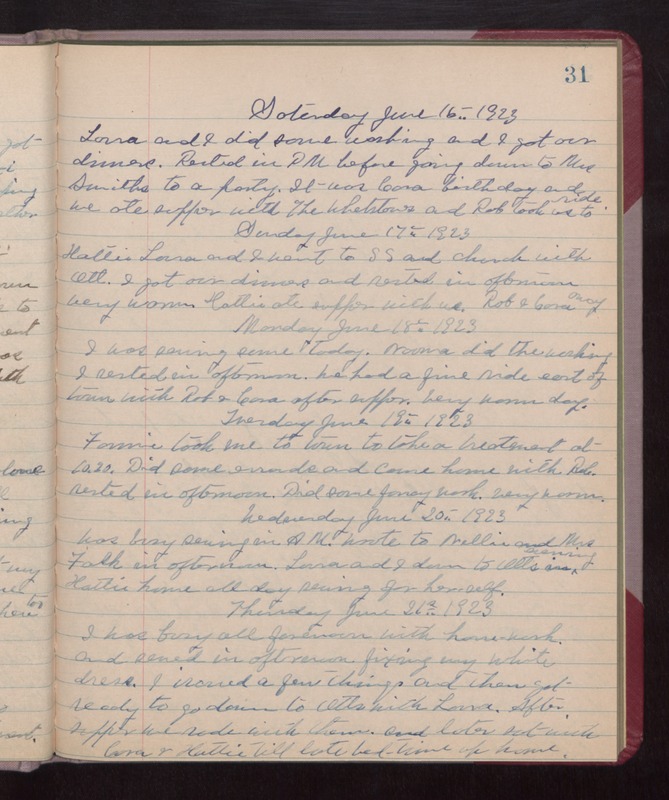 Sunday June 17th 1923 Hattie, Laura, and I went to S S and church with Ott. I got our dinners and rested in afternoon. Very warm. Hattie ate supper with us. Rob & Cora away. Monday June 18th 1923 I was sewing some today. Norma did the washing. I rested in afternoon. We had a fine ride east of town with Rob & Cora after supper. Very warm day. Tuesday June 19th 1923 Fannie took me to town to take a treatment at 10.20. Did some errands and came home with Rob. rested in afternoon. Did some fancy work. Very warm. Wednesday June 20th 1923 Was busy sewing in AM. Wrote to Nellie and Mrs Falk in afternoon. Laura and I down to Otts in evening. Hattie home all day sewing for herself. Thursday June 21st 1923 I was busy all forenoon with housework and sewed in afternoon fixing my white dress. I ironed a few things and then got ready to go down to Otts with Laura. After supper we rode with them and later sat with Cora & Hattie till late bed-time up home.